We are excited to finally be able to tell you the first (and biggest) piece of news about our distribution plans. We’ve been bursting at the seams to share this for MONTHS. 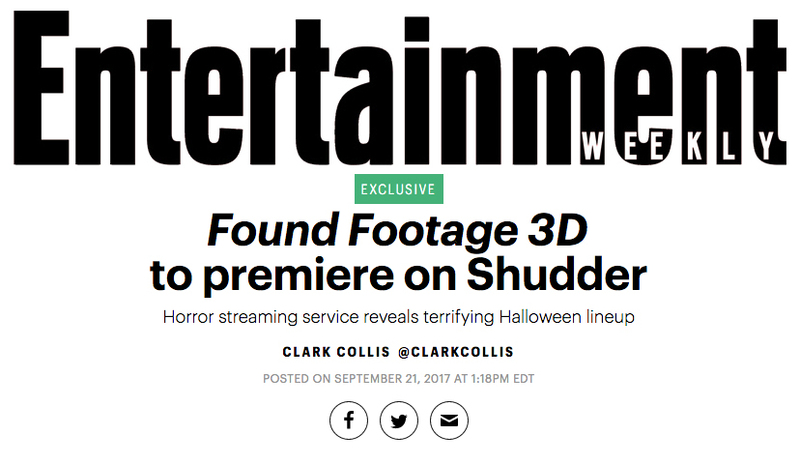 Found Footage 3D has been bought by AMC Networks for their horror streaming service Shudder, which has been called “The Netflix of Horror“. The movie will be available on their streaming platform starting October 26th, just in time for Halloween! And best of all, it will be available in 2D, 3D side-by-side (for 3D televisions and VR), and red-blue anaglyph 3D. Indiegogo backers: dust off those 3D glasses! Shudder is currently available in the U.S., Canada, the U.K., and Ireland. But as we have mentioned, this is only the beginning of the good news. More territories will be announced soon, as will plans for further media, including DVD, blu ray, iTunes, etc. We know that many of you have been on this journey with us for several years, and we are so grateful for your support and your patience. We can’t wait to finally share the film with the wider world! Check out the write up in Entertainment Weekly.